Aww man. I knew going into this book that it was gonna be rough. I knew this was not gonna be a fluffy book. I thought I was emotionally prepared. I was not. I thought I knew how the story was gonna go. I did not. This story managed to completely sucker-punch me and I will carry it with me for a long time still, that’s for sure. I agree with the New York Times, this book should be mandatory reading. Because the topics it explores are super tough, but also important. Homophobia, acceptance, depression, suicide, friendship, love, mourning, family, denial, memories and the pursuit of happiness are some of the main themes and they are handled exquisitely. This book makes you think. And it makes you think outside of the box and put yourself in someone else’s shoes. There may be times you want to put this book down and stop reading. I know I did. Some of the characters are despicable. Some of their thoughts and motivations are depressing and frustrating. Even our main character, who despite his lovable personality, is still super flawed and makes some bad calls. But that makes the whole thing so much more realistic. And luckily there are still some lighter, funny moments in the book to balance it out and to help you keep going. This may be one of my shortest reviews ever, but I don’t want to spoil anything else for you. Please just dive into this and let the story take you along for the ride. It is a masterpiece of a book and if this was his debut, I am super curious to read more by Adam Silvera. 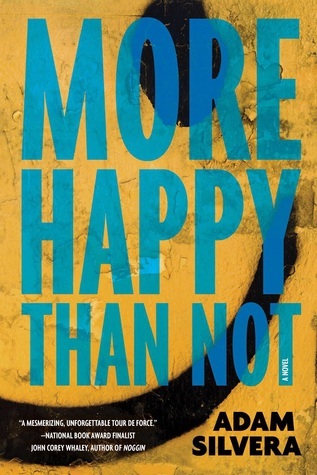 Have you read more happy than not? What did you think about it? That’s great, I hope you’ll enjoy this one too Lauren! It was heartbreaking, but truly amazing!